For decades, nutritional science has been telling us that fat is bad for us and that carbs – even sugar – were the key to health. Modern research has proven the opposite, however, because excessive sugar consumption is implicated in diabetes, heart disease, and a host of other ailments. With all this research, however, it’s still somewhat difficult to explain low carb for beginners. Constant, system-wide inflammation due to an overproduction of insulin is triggered ultimately by too much carbohydrate intake. This inflammation leads to the diseases mentioned above, in addition to weight gain and just general poor health. Low carb eating helps you resolve this inflammation while you lose weight and regain your health. As your carb intake goes down, so does your insulin levels, which forces your body to run on fat-derived ketones for energy, a state called “ketosis”. As insulin levels drop, your cells begin to become sensitive to insulin again, which studies indicate could mean a reversal of type 2 diabetes and a dramatic lowering of your risk of heart disease and certain cancers. So if you want to collapse your risk of lifestyle diseases, improve your physique, add years to your life, and just regain your health, a low carb diet might just be the ticket. 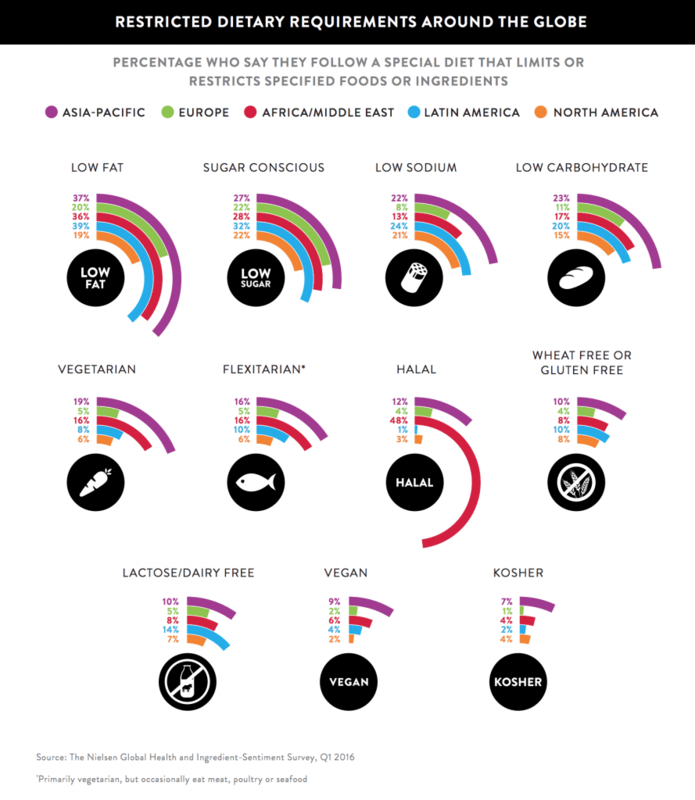 How are people eating around the world? According to a study by Nielsen in 2016 titled “What’s in our food and on our minds?” report. Asia-Pacific and Latin American regions had the highest number of people eating a low carbohydrate diet. 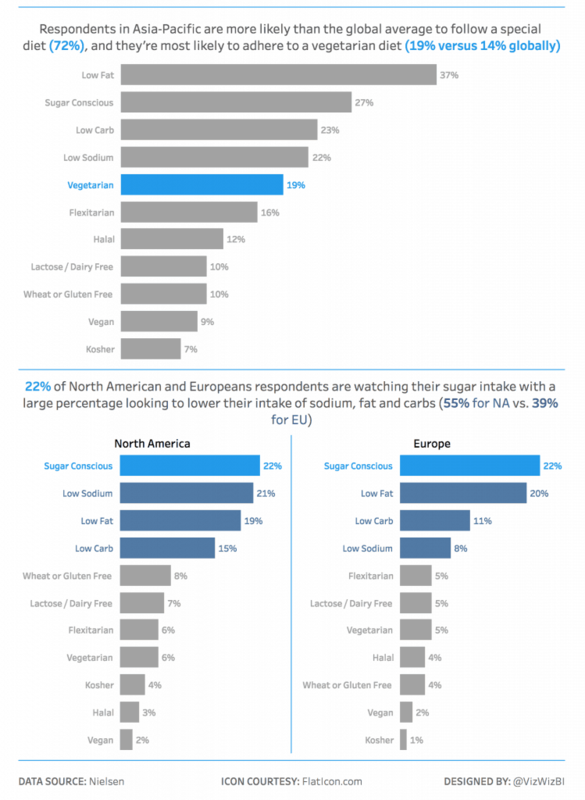 Vizwiz took the same data and did a different visualization design of the global diet report from Nielsen. What are the benefits of low carb diet restrictions, and how does it work? Well, the first part should be simple enough – cut out carbs. This means no pasta, no bread, and certainly no candy. These are all carbs that spike blood sugar and lead to the problems we’re trying to heal. In fact, the fastest, easiest way to get into ketosis or to fix your insulin response is to keep your carbs under 100 grams a day. Your brain needs about 100 gram of glucose per day to function; anything under this typically triggers nutritional ketosis. The key here is to avoid processed carbs, eat plenty of healthy fats, and a moderate amount of protein. 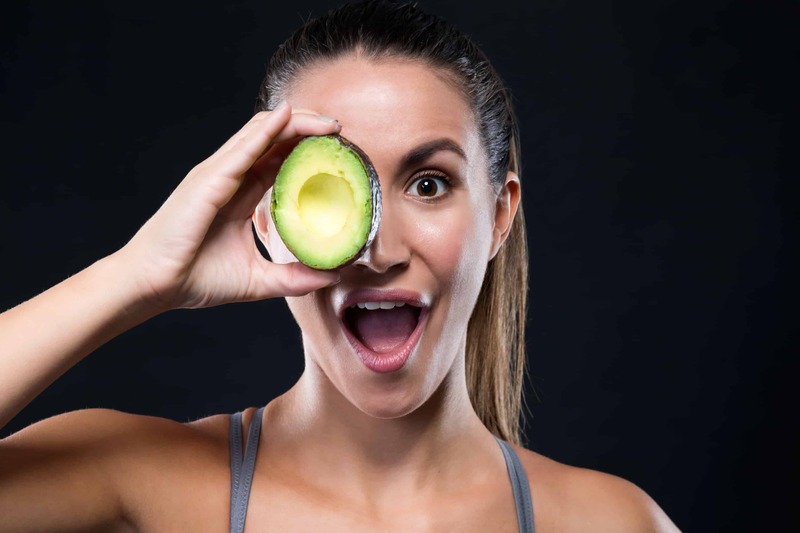 It’s also a good idea to avoid frankenfoods that claim to be good for low carb dieters, as they’re typically processed into oblivion, and the claims they make are dubious at best. You’ll also want to eat until you’re satisfied, without counting calories or breaking out your kitchen scale to measure food. Eating low carb foods allows your hunger hormones to regulate themselves, which in turn will get your hunger in check. Anything that is similar to those items on that list above are things to avoid. These foods are healthy and they fit into a low carb diet, but they’re not free-for-all foods. Count the carbs and use them sparingly. You’ll also definitely want to avoid processed fats like margarine and canola oil, vegetable oil, and trans fat completely. They’re not healthy for anyone, and to truly reap the benefits of low carb diet lifestyles, it’s about changing the way you look at all food. Drink plenty of water, black tea, and black coffee, and you can use heavy cream or half & half instead of milk. Unsweetened nut milk works fine, too. If you want to get the benefits of low carb eating as quickly as possible, you should restrict your carb intake to about 20 grams or less a day, for at least 2 weeks. This is often referred to as “induction” and will prime your body to burn fat for fuel instead of sugar. Adding in some exercise is a great way to utilize any carbs your body is still storing as glycogen and will help get your body burning fat faster. In addition, there’s good evidence that exercising while eating low carb burns more fat directly than if you were eating a high carb diet. Once you’re fat adapted and in-step with a low carb lifestyle, your hunger levels will likely diminish. One positive thing here is that you might find that you’re not hungry when you wake up. Skipping breakfast is not the big problem we’ve been told it is for years, and in fact, being fasted has a lot of positive benefits, and low carb helps make fasting significantly easier! Essentially you’ll stop eating after say, 8:00 pm at night and not eat again until noon. Not eating carbs helps your blood sugar stay stable, so you won’t be hungry and you’ll still have energy! A well-formulated low carb for beginners nutrition plan would emphasize moderate protein, high fat, and low carbs, but you’ll also want your carbs to come mostly from leafy greens. Getting that fiber in will help bind dangerous triglycerides in your blood, and also keep you going to the bathroom regularly. Within the first couple of weeks of a low carb diet, you’ll likely lose a lot of weight, sometimes up to 15 pounds. Now while this is one of the nice benefits of low carb diet lifestyle changes, about half of this is probably water weight. The reason is that your body stores sugar as glycogen in your liver and muscles, and it’s stored in water. When your body doesn’t have glycogen to hold onto, it sheds the water, so those first couple weeks, you’ll be going to the bathroom a lot. Keep your fluid intake high and ride it out. In fact, one of my favorite low carb diet tips is to carry a jug of water around with you. It might seem silly, but it’s a great way to ensure you’re hydrated! Because of this fluid flush, however, your body will be somewhat deficient in both sodium and magnesium. It’s a good idea to liberally salt your food, and probably to take a magnesium supplement. Potassium is important as well, but you should get that entirely from foods like spinach, avocado, and salmon. Supplementing potassium is something to be done only under strict doctor’s guidance! The deficiency in sodium can cause what’s often referred to as “keto flu” or “induction flu”. It can mess your stomach up, sending you running to the bathroom. It can also cause malaise, headaches, fatigue, and moodiness. The fatigue, headaches, and moodiness can be solved by supplementing the aforementioned sodium. A lot of people drink pickle juice for this, which sounds weird, but it does the trick! As for your stomach, a little ginger tea does wonders. Whatever happens, fight the urge to go back to the way you ate before – just a little push over this hill and you’re in the sweet spot of low carb living. How does a low carb diet stack up against other diets? A lot of people might try to tell you low carbing is dangerous (nonsense), or that it’s a fad diet (it’s been used for over 100 years to treat childhood epilepsy), but what we really should be concerned about is how it stacks up to other popular ways of eating. There’s hardly a comparison here. High carb diets have been suggested to manage diabetes and heart disease for decades and they simply don’t work. In fact, diabetes is known for a fact to be caused by too much sugar intake; to recommend people increase their grains and “healthy carbs” to treat it is absurd. There are no benefits to a high carb diet unless you have some sort of disease that requires you to eat like that, or you run ultra marathons. Truly in the low carb diet vs high carb diet fight, low carb wins 100% of the time. These don’t need to necessarily be at odds. 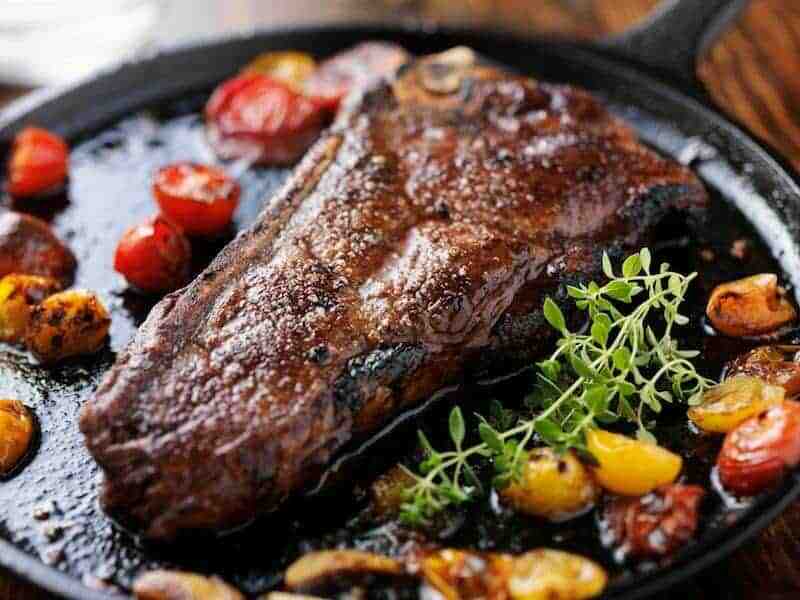 The ketogenic or keto diet is a logical progression of eating low carb. Ketosis is the state of fat burning that results from very low carb eating, and it’s pretty easy to maintain once you’ve been inducted. The big differences here are that with low carb, you can go up to 50-100 grams of carbs and still get positive results, but to be in ketosis, your carbs probably shouldn’t go over 30 grams a day. Keto, however, offers increased clarity and a faster resolution of high blood pressure, high blood sugar, and high cholesterol, but it’s a little harder to stick to for some people. 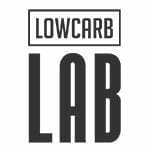 In the low carb diet vs keto diet argument, there’s definitely merit on both sides, but it’s probably best to suggest low carb for beginners. Another failed experiment, the low-fat diet has plagued us for several decades now. By artificially processing the healthy fat out of food, companies had to add in sugar. This is basically a rehashed version of the high carb diet, but with the added caveat that you also can’t have fat. Everything is bland, tasteless, and overly processed. A low-fat diet also runs the risk of not providing enough essential fatty acids! Definitely a bad way of eating, unless you’re truly 100% whole food vegetarian or vegan, then it might be healthy. Regardless, a contest of low carb vs low fat will always prove the low carb diet as the winner. There are so many health benefits of low carb diet changes that even dropping your carb intake to under 100 grams a day will have a significant impact on your life. The big ones are that is that it can utterly collapse your risk for diabetes, heart disease, certain cancers, and strokes. Beyond that, you will lose weight, have clearer skin, better mental focus, higher energy, and more endurance. Talk to friends or colleagues who have done it; they will be full of low carb diet tips that will help propel you forward because they’ve lived the change. Weigh yourself, take measurements of your body with tailor’s tape, and dive right in – you’ll be surprised how much you’ll change in just 2 weeks!